The following examples show red, dashed relationships with text labels at the start, middle and end of the line (and different start/end arrow heads.) The left is a curved link and the right is a right-angled link style. Relationships are often used to create visual associations between topics that are perhaps unrelated hierarchically. Floating topics are topics that have no parent. They can be placed independently of any other topics. 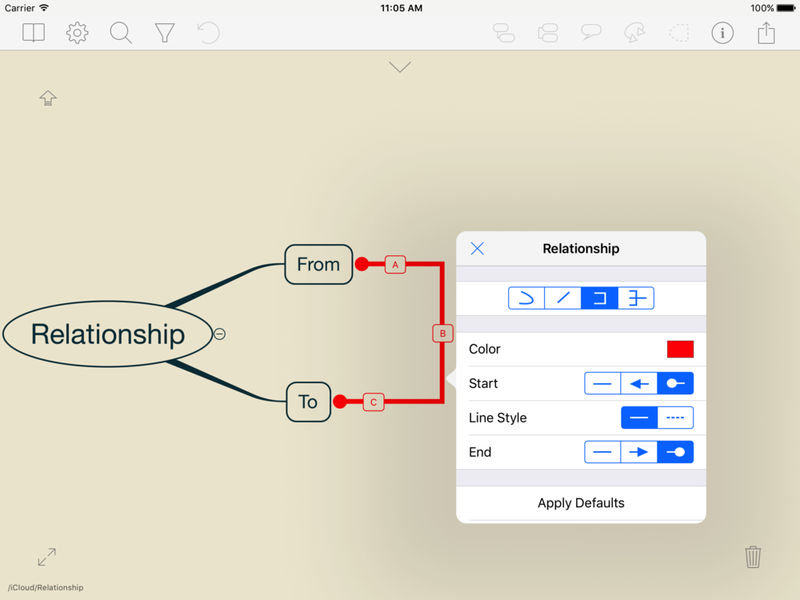 Relationships can be 'strung' between floating topics to create entirely new diagram types. 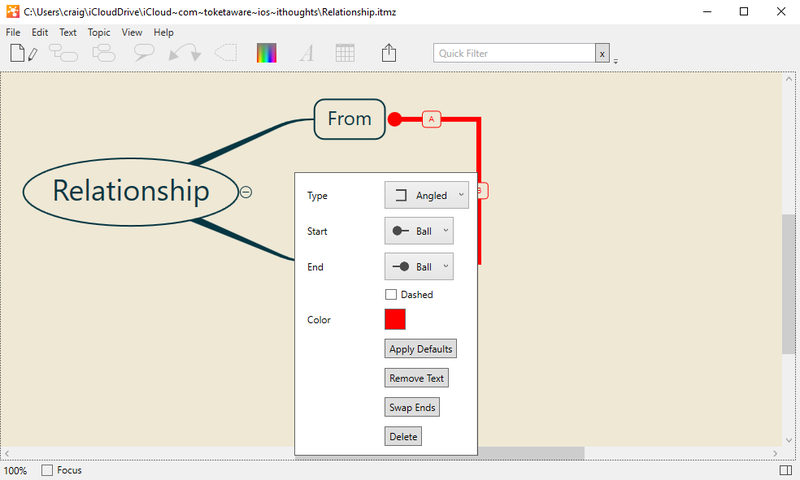 In the following example we can see a concept map type diagram and a process/flow type diagram - both created using floating topics and relationship link lines. This approach can also be used to add 'arbitrary lines' to normal maps. In the following diagram, the horizontal line is a relationship strung between 2 floating topics that have no shape or text and so are invisible. The other angled links are strung between the blue oval floating topics and more hidden (no shape/text) topics above and below the horizontal line. Select 2 topics then click the relationship toolbar button. Select 1 topic then CMD+double click another topic. Select 1 topic, tap on the relationship toolbar button, tap on the second topic. Drag the relationship toolbar button and drop it on a topic then tap on the second topic. Select 1 topic then SHIFT+double click another topic (using the on screen SHIFT button just below the toolbar). Select 1 topic then CTRL+double click another topic. To change the path of a relationship link line (curved or right angled styles only) simply drag anywhere on the link line. To add text to a relationship, select it then double click/tap one of the 3 small rectangles with a + in their centre. To modify a relationships color, arrow head, style etc. [Mac/Windows] Right click on the relationship link line. Any changes to the relationship styling/text is saved and then reapplied to the next relationship you create. This is one of those things that can be a massive timesaver or massive PITA - sorry! Ordinarily, when moving a parent topic its children will also move. However, related floating topics are 'peers' so each moves independently of the other. Often you will want to move a group of related floating topics as one. The solution is to select all the floating topics and then move them. For this there is a shortcut! Long Click/Press on a topic (for around half a second) and all related topics will also be selected - and then can be moved as one. If you have a force touch trackpad (on your Mac) then you can force touch to select all related. When moving a floating topic, it will 'snap' to align with other visible floating topics (sorry - I just like things to line up :-) To disable snapping, hold down CTRL whilst dragging (on OSX.) On iOS, you'll need to disable snap in the Preferences. There is also the option to 'nudge' a floating topic one pixel at a time by pressing ALT + Arrow. On iOS you can use the on screen arrow keys (2 finger tap the canvas) and hold down the SHIFT button. There is one final type of relationship - the Summary Relationship. Summary relationships are intended to enable a 'many to one' type link. Below you can see how the 'Summary' topic appears to have multiple parents. In reality, its parent is actually Topic2, but Topic1 and Topic3 have relationship links to the Summary topic. Summary Relationship link styles have some unique properties. They cannot be 'styled'. Their color is the same as the topic they are linking to and their shape is the same as if it were a parent/child link. The topic to which the summary relationship is linked (the 'Summary' topic in the example above) is automatically excluded from any auto layout. This enables you to position the topic wherever is most appropriate. By default, if you create a relationship from an 'uncle' to a 'nephew' (e.g. from Topic1 to Summary in the example above) then that relationship will be a summary relationship. If this is not what was intended then you will need to right click (or long press) on the relationship and change its properties. Likewise if you want a summary relationship from a totally unrelated topic then create the relationship as normal then right click/long press and change it into a summary relationship. NB: You will also notice that the link lines to the summary topic are 'reversed' (from the normal parent/child links.) This is by design - it just looks better!